I think Wolfram is perpetually in the “kid genius” mode – he had great expectations for himself, as did everyone around him. Mathematica was cool. But he’s been ruined by his own “potential” and mainly serves as a cautionary tale to the rest of us now. Actually there aren’t many tools out there that offer a comparable breadth of graph-related functionality. I really doubt that you can use MATLAB for this (!!). I agree that unfortunately Mathematica’s graph related functionality has some serious quality issues … I’ve complained about this many times before. I also noticed that when using EdgeDelete on (weighted) graphs, things tend to get broken, and a silent wrong result is really unforgivable, and should warrant an imminent bugfix release. 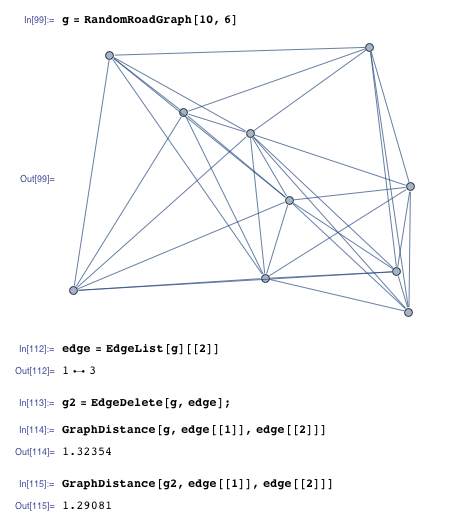 You can also try my package IGraphR which makes it very easy to call igraph from Mathematica. Since I don’t fully trust graph-related results form Mathematica, and since these results are usually hard to verify, I usually compare them to igraph. My package doesn’t support weighted graphs yet, but there are usually workarounds such as sending weights explicitly to igraph. RandomRoadGraph is not a Mathematica function in either version 9 or 10. I can’t tell if the problem is in your code or Mathematica’s. I don’t do graph theory much, but the bits I use seem to be OK.
that function is my code, but that’s not the point. it simply produces a starting graph. everything after that is mathematica code, and it’s clearly operating incorrectly. the post was written a while back, so it may have been fixed.